That while we are working, you can continue the everyday routine of your household with the very minimum of disruption. Our fully qualified painters respect you as well as your home; you’ll find them to be refreshingly friendly, courteous and knowledgeable. Our company’s reputation is based on honesty and integrity that we bring to every interior painting project. Our main focus is on the details of every project that we do as well as focusing on you, our client. 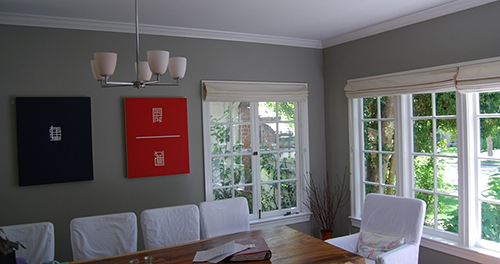 We understand hiring a painting company is not an everyday occurrence for you. We want to make it an enjoyable experience, with every painting project there is education and preparation that will occur in order to ensure that your interior painting project runs smoothly and according to your requirements and expectations. As a result, we have gathered a team of fully professional staff members in order to make sure that we can create the best possible painting experience with you. We are well versed in every aspect interior painting, from painting one room to your complete house, prior to starting your project we will sit down and discuss a schedule that you are comfortable with. You can be rest assured that at the completion of every work day, your house will be left neat and tidy, and at the end of the project we will ensure a complete vacuuming and wipe down of all furniture and personal belongings will be in order. We dispose of all left paint and thinners in an environmentally friendly manner, we leave touch up paint clearly marked for you so that if you need to touch up an area at any time in the future, it shall be ready for us.